The Skinny: A no-holds-barred look at real-life pro wrestling icon Rikidozan, a Japanese national hero who just so happened to be an ethnic Korean. Although perhaps a bit too long, the film has excellent historical value and provides a genuinely compelling tale of one man's rise to the top against all odds. Professional wrestling, it has been said, is soap opera designed for men. Rather than be classified as an actual sport, wrestling is what's euphemistically referred to as "sports entertainment" since the outcomes are, as most now know, predetermined. Yet what laymen usually don't realize when they dismissively call wrestling "fake" is that it usually involves an intense behind the scenes power struggle. Who wins and who loses a match is of prime importance to not only the overarching storyline presented to the wrestling audience, but to the wrestlers themselves and ultimately their livelihood. And despite its lowbrow associations, professional wrestling often reflects or, in some rare instances, even influences the dominant culture to a great degree. 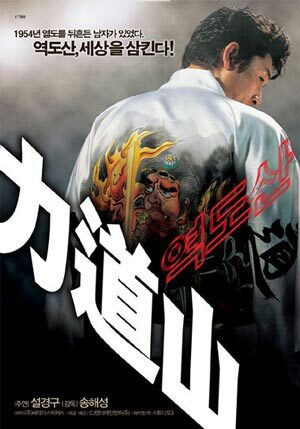 Both the out-of-the ring political jockeying and the intense cultural influence of wrestling are covered in Rikidozan: A Hero Extraordinary, Song Hae-Seong's compelling, if flawed, 2004 bio-pic of the legendary "Father of Puresu." Silmido's Sul Kyung-Ku learned Japanese and put on weight to play the role of Rikidozan, a Korean immigrant who originally went by the name Kim Shin-Rak. The film begins in 1950s era Japan and charts Kim's rise to fame from humble beginnings. Having immigrated to Japan to learn sumo wrestling, Kim finds himself a victim of prejudice due to his Korean heritage. Even after cleverly finding a way to ascend up the ranks, racism prevents him from achieving his dream of competing for the celebrated title of Yokozuna. Feeling that he's wasted ten years of his life, Kim cuts his top-knot, quits sumo wrestling, and slinks off into a world of utter despair. At this point, everything in his life seems be going straight to hell, but Kim gets a lucky break. Thanks to a chance encounter with a pre-Goldfinger Harold Sakata (Keiji Mutoh), Kim gets introduced to the world of professional wrestling. With the backing of his mentor/benefactor Kenno Takeo (Fuji Tatsuya), Kim goes to the United States to learn the ropes and returns to Japan as Rikidozan, an iconic figure who would go on to have a major impact on professional wrestling, transforming it from an unknown commodity in Japan into the country's most popular sporting attraction. With the Japanese people finding themselves on the losing end of World War II, their morale was at an all-time low. Rikidozan theorized that they were looking for heroes to root for, and that pro wrestling (and by extension, himself) helped fulfilled that need in spades. And as it turns out, he was right. In a scene that would seem unbelievable if it didn't actually happen, a crowd of thousands gather around a small television in a public square to watch as Rikidozan and his tag partner face off against the intimidating Sharpe Brothers, an imposing duo of Americans (in actuality, they were Canadians, but the Japanese didn't know that). In a stunning bit of athletic theatre, Rikidozan turns the tables on the American "bullies," and in the process, wins over the hearts and minds of the Japanese in a sequence that is at once thrilling and moving, despite its pretty much telegraphed ending. Of course, with Rikidozan's Korean origins, it's ironic that he would become a national icon, a fact touched upon by the filmmakers later in the narrative. After achieving a measure of fame, Rikidozan drops in on an old Korean friend. When his buddy asks him to reveal his identity to the public, Rikidozan responds, ""I am Rikidozan, and I belong to the world." As it turns out, having his background revealed is the least of his worries: a crumbling marriage, a horrible temper, and backbiting galore from his pro wrestling comrades seem to put Rikidozan on a collision course with disaster. But somehow he perseveres. But as much as the film sounds like an example of hero worship, Rikidozan: A Hero Extraordinary is far from a fluff piece. Certainly the man's positive strides are depicted, but so, too, are his failures. Hard-headed and prone to violence, Rikidozan is a flawed man indeed. Miki Nakatani portrays Rikidozan's long-suffering wife Aya, and it's her presence that reminds viewers just how much of a selfish cad he can be. Interestingly enough, the "realities" of pro wrestling are treated somewhat ambiguously. Unlike The Foul King, which despite its comic premise showed the ins and outs of professional wrestling with remarkable candor and faithfulness, Rikidozan wants to have it both ways. Although people "in the know" will understand exactly what is being portrayed in the behind-the-scenes confrontations, the scenes are depicted in such a way that if one wants to believe that wrestling is "real," there's really nothing in the movie that would contradict such a belief. Sure, there are payoffs and people "throwing matches," but these incidents are made to sound like the outcome of a legitimate sporting event like a baseball game or a boxing match were in question, not a wrestling match.